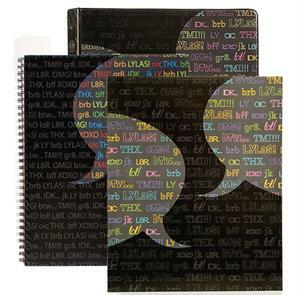 When it was time to shop for school supplies when I was younger, I was always wanting the folders and notebooks with the cool designs or pictures on them. Occasionally my Mom would buy them for me, but for the most part they were too expensive and she bought the boring old plain versions. If only we had known about Carolina Pad! "In 1945, former teacher, principal, and coach Joseph K. Hall II began selling school products out of the back of his trunk. He wanted to deliver products based on a core philosophy of "service, reliability, and quality at a fair price.” More than a half century later, this philosophy still guides Carolina Pad in developing school, office, and arts and crafts products with superior function and innovation. Carolina Pad’s growing portfolio of brands includes Studio C™, Note2Self™, Notebound®, u:create®, Ghostline®, and Sasquatch. Carolina Pad products can be found on the shelves of such leading retailers as Target, Walmart, Walgreens, Harris Teeter, and Staples." This bundle is priced at only $10. Talk about a steal! These products are also a lot better made than most of those plain "cheap" folders my Mom used to buy. I used to use several of those per year because they kept ripping or falling apart. I don't have to worry about that with the Carolina Pad Chat Bundle. My favorite item from the bundle is the 1-subject notebook. I have always loved writing and while I was growing up (and even now) I have always kept a notebook with me for writing down random thoughts and ideas. The 1-subject notebook has a really thick cover. So, you don't have to worry about it getting bent or easily destroyed. It also comes with a "Me, Myself & I" page that is great for not only kids, but it is great if you lose your notebook. It also has holes in it so that you can insert it into a binder if you want. Last but not least, it has the cute chat design on the outside that this entire collection has. It displays chat terms such as brb, gr8. and lol! This design is great for anyone! Almost everyone I know uses these terms either via email, Facebook, text or chat. The next item is the binder. It is a 1 inch binder that holds up to 175 sheets of paper. I received the pink chat binder and it is super cute and girlie. This binder is great for holding homework assignments, memo's or just about anything. I am using mine to organize my reviews and giveaways for this blog. I often receive printed material along with the products for review. I am punching holes into them and filing them in this binder. It also has 2 pockets for those times when you don't have a hold punch around. The final thing I received was three 2 pocket folders. These are strong well made folders that will definitely last a semester or more. The only thing I wish they had that they don't is prongs to insert paper in the middle of them. However, they do have holes that you can punch out to put them into a binder. I am using mine in my binder for extra pockets and protection of important materials. So, head on over to Carolina Pad and check out all their great designs and great products. In the meantime, you can enter to win the Chat Collection bundle! Visit Carolina Pad and tell me what your favorite design is. Giveaway ends 6/21/10 at 9pm EST. Giveaway is for US and Canada residents only. You are not allowed to win if you have won a prize from Carolina Pad within the last 90 days. No P.O. Boxes. Winner will be chosen randomly. Winner will be contacted via e-mail and then will have 48 hours to respond before a new winner will be chosen.